Federation University Australia’s new Chancellor, Mr Terry Moran AC, has been officially appointed at an Installation ceremony on the Mount Helen campus. The ceremony in the Geoffrey Blainey Auditorium was presided over by Her Excellency, the Honourable Linda Dessau AC, Governor of Victoria, who helped gown the new Chancellor in his official academic robes as part of the time-honoured tradition. 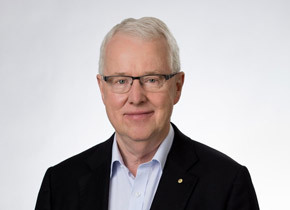 Mr Moran is the University’s sixth Chancellor and brings a wealth of experience and knowledge to Federation University Australia, having held the position of Australia’s most senior public servant during his distinguished career. Mr Moran was appointed by former Prime Minister Kevin Rudd as Secretary of the Department of the Prime Minister and Cabinet in 2008. He served under two Prime Ministers and was responsible for leading Australia’s highly successful policy responses to the global financial crisis in 2008 and 2009, as well as matters of national security and international policy. Prior to this, Mr Moran was the Secretary of the Department of Premier and Cabinet for the Government of Victoria between 2000 and 2008 – the most senior role in the Victorian public service. Mr Moran was named as an Officer of the Order of Australia (AO) in 2006 and a Companion of the Order of Australia (AC) in 2012 for his service to the community through public sector leadership. During the global financial crisis in 2008-09, Terry Moran helped to lead the development of Australia's highly successful policy responses. He also led development, negotiation and implementation planning for the National Reform Agenda for the Council of Australian Governments, work he began while head of the Victorian Public Service. Earlier this year he conducted a strategic capability review of the Southern Australian TAFE system at the request of the South Australian Government. Mr Moran is an Ambassador of Teach for Australia, a global movement dedicated to breaking the cycle of disadvantage through teaching and leadership in education. He also chairs the Melbourne Theatre Company and the Centre for Policy Development, an independent think tank. Mr Moran lives in Melbourne and began his three-year term as Chancellor at Federation University Australia on 13 October 2018.